I am working on a project right now that needs to be eclectically decorated, which is why I’ve been investigating this design style recently. The key to eclectic is having a strong common denominator. So, you can gather a range of items, but they must have something in common. For example, a particular colour could be the dominating design feature, texture can make the design feature by having a variety of it, or a particular type of line or shape throughout the room. The most common connecting factor I find in photos of eclectic design is colour. It’s an easy one to choose, because people often inadvertently gravitate to particular colours, and find themselves with a whole lot of things that mesh well into a scheme by colour. 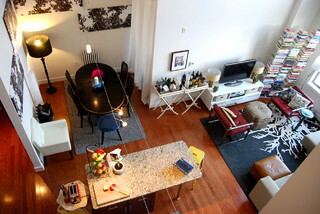 I’ve been searching one of my favourite sources of inspiration… http://www.houzz.com. Here are a few photos I found, that mainly have colour as their design element. I’m such a sucker for the eclectic-frames-on-the-wall look. I just love it. It’s such a good way to collate a range of interesting photos and art and other items, and looks really attractive in the right room. 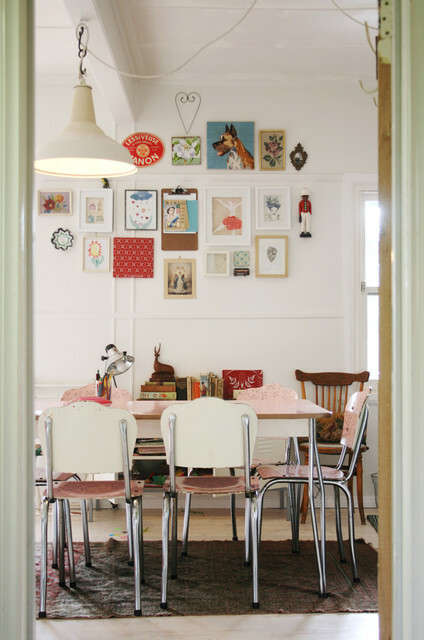 The high ceilings in this room are good because too many things on a shorter wall can look too cluttered. The cool colours and raw concrete of this room would be the perfect work or sitting space in our hot Brisbane climate. 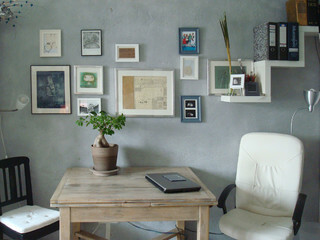 I love the simple mixture of frames, and a plant on the table is such an easy way to spruce up the room. It provides necessary oxygen too! This modern styled room is eclectic, but not cluttered. The limited colour palette allows varying patterns and shapes to bring life and vibrancy to the room. How much fun is this room! It’s vibrant, comfortable, light and refreshing. I love that it looks loved and easy to live in. Connected by black and white and grey, with splashes of colour, this small loft space has been divided into zones by texture and varying styles. It may feel somewhat cluttered and busy to some, but it certainly feels well lived in and interesting.